Where were you in 82′? Have you ever seen Tron: Legacy? Probably one of the best scenes in the whole movie is when the main character Sam, walks into his fathers old video arcade, flips the breaker and all the machines go on and Journeys Seperate Ways comes on the jukebox. For a lover of retro games and old vinyl it gets your heart pumping, and really makes you miss the old days of great video arcades and music on a Saturday night. What’s really interesting about the use of this song in Tron: Legacy is not just that it was popular when the first Tron movie came out in 1982, but that in this movie about video games Journeys 1981 album Escape had a video game based on it, also in 1982. Thats right? The early 80’s classic filled side to side with great music including songs like Seperate Ways, Don’t Stop Believing, and Faithfully had a video game based on it. Jouney Escape Vinyl Album and Atari 2600 game. Be sure to check out my vinyl record collecting blog Diary of An Amateur Vinyl Record Collector or my retro video gaming blog The Retro Video Gaming Blog for the Mid-Core Gamer. Escape is actually Journeys eighth album, but it was the first to go to number 1 on Billboard. The album was released in July of 1981, and saw its first hit Who’s Crying Now before 1981 was out. After that the album would see hit after memorable hit with Stone In Love exiting the charts in 1984. Escape would leave an indelible print on music of the early 80’s and on music of the 80’s in general, and would also influence the previously mentioned Tron, when Journey would be asked to do part of the original movies soundtrack. This was another eBay purchase that I am pretty pleased with. It was a quick transaction and the record came in exactly the condition described, which is in fantastic. No scratches or anything else, nice clean play all the way through. Best of all its a great up beat album from start to finish, and really gets your night rolling by putting you in a good mood. As you can see in the photo above the album cover itself is also an phenomenal shape with its original shrink wrap and stickers still intact. It was another great buy on eBay and one heck of a bargain. Data Age released Escape in 1982, and it was the first video game of its kind to be based on a popular music group and album. The game is actually fairly simple and consist of a black, down scrolling screen, and of a little man that you must control on the screen meant to represent a security guard trying to help the band to get to their scarab shaped escape vehicle, well also trying to hang onto the $50,000 in concert money. Along the way the little man avoid hearts with legs which are meant to be groupies, bodiless heads with mustaches and shifty eyes that are meant to be promoters, barricades, and flashing yellow lights which are meant to be paparazzi. From time to timeyou can get help from what appear to be little aliens with antennas, but I understand that they are actually meant to be roadies who give you the temporary power to walk through various obstacles. Also supposedly there is the band manager who looks inexplicably like the Kool-Aid man and is also supposed to help you although I have never run across him in my gameplay. Your ultimate goal is to reach the yellow scarab escape vehicle, which you probably could pass-by pretty easily if you weren’t looking for it, and to reach it while hanging on to as much of the concert money as possible. Keep in mind that each obstacle you walk into will take some of the money from you. Every time you help the band reach the escape vehicle a new level starts and each level gets progressively harder, and obstacles no longer stay stationary, but begin to move towards you or across the screen in random directions. The game obviously ends once all the money is taken from you. As far as the game music the only actual Journey song we hear is Don’t Stop Believing in the games intro, during the actual gameplay itself we are given some sort of generic music that is in no way related to anything by Journey. Without going online and looking at the directions I had a hard time actually trying to figure out what the heck I was supposed to be doing and differentiating friend from foe coming at me. Luckily, I was able to find instructions on Atariage, and after that the game actually became pretty interesting, fun, and at times even challenging. Other than that it’s a pretty good game but there are a few things that I was little let down by. First of all considering Escapes album cover I expected the game to have some sort of sci-fi theme to it. After all the album cover for Escape shows a scarab breaking out of a planet or something into outer-space and the back of album shows the scarab zooming off in outer-space. Of course that’s fairly minor, but the biggest letdown is that there wasn’t any actual Journey music during gameplay. Sure it’s nice to hear Don’t Stop Believing in intro, but it would have been cool to have actual Journey music throughout. Overall though I have to say that I am really impressed by both the album and the video game. Both Escape’s are fantastically entertaining, although the album has much more and notoriety and is pretty well remembered, while the videogame lives obscurity. 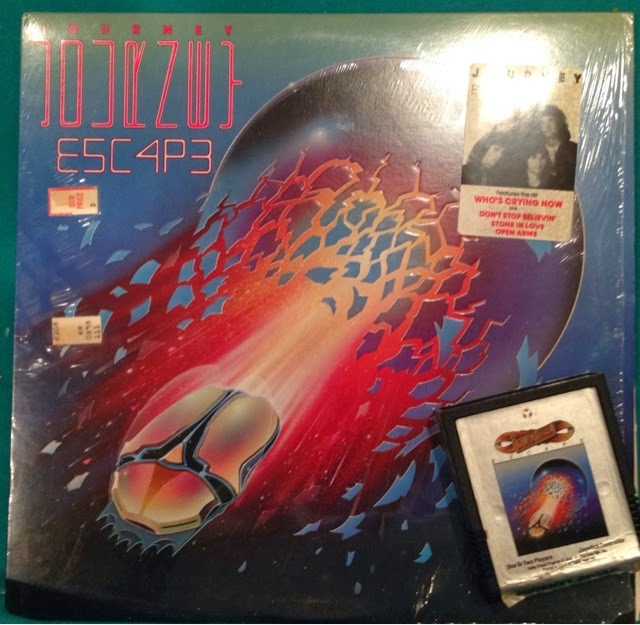 I can only imagine being a teenager in 1982 and feeling like I was on top of the world having Journey’s Escape playing on the record player well I played the accompanying game on my Atari 2600. It must’ve been a heck of a way to waste a Saturday evening back then, in what seemed like much simpler times. I have to say I thoroughly enjoy owning this album and I really have enjoyed having a chance to play the game. If you have a chance to buy this particular album on vinyl I would definitely suggest doing so because nothing else sounds the same. And if you have the chance to buy the Atari 2600 game for it do so as well. You won’t be let down by either.